Greg Pettis - California Consulting, INC.
Greg Pettis is a Senior Associate for Southern California. Mr. Pettis serves Southern California with an emphasis on Riverside County, Imperial County, and the Coachella Valley. Since 1994 Mr. Pettis has been an elected City Councilmember for the City of Cathedral City. He has been a member of the National League of Cities since 1999 and has served on the board from 2013 – 2015. Mr. Pettis has been a member of the League of California Cities since 1999 and has served on the League of California Cities Board of Directors from 2010 – 2016. 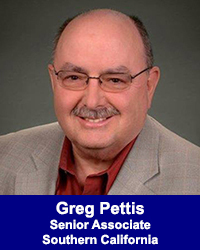 Mr. Pettis has been involved with the Southern California Association of Governments (SCAG) since 1999. He served as 2nd Vice President, 1st Vice-President. and SCAG President. SCAG is the largest regional transportation organization in the nation. Mr. Pettis is the current Chairman of the Transportation Committee for the Coachella Valley Association of Governments and has been on the Executive Committee since 2000. He served as a Governing Board Member for the Riverside County Transportation Commission since 1999 and served as Chairman in 2011. From 2009 to 2013 Pettis was a member of the Southern California Regional Rail Authority, (Metrolink, So. Cal’s Commuter rail service). Mr. Pettis holds a B.A. from Azusa Pacific University, an MBA from the University of Phoenix, and is a 2005 graduate of the League of California Cities Mayors and Councilmembers Academy. In 2007, Pettis graduated from the Senior Executives in State and Local Government program at the Kennedy School at Harvard and in 2012 he attended the Executive Education program in Public Policy at the Price School at USC.